If there would be only one thing I could do in Barcelona, it would be a visit to Gaudi's Sagrada Familia, in fact it would be worth a trip alone. The Sagrada Familia is a most beautiful, astonishing and breathtaking monument to nature, and a most joyous and awe inspiring place to be. 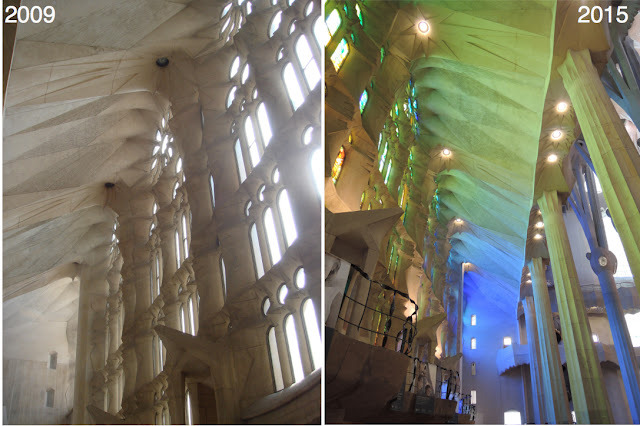 Gaudi's plans and visions for the construction, function and decoration of the church were entirely based on the organic forms and shapes of nature, while inventing ground breaking structural designs based on his studies of plants. The immensely tall supporting columns follow the natural weight distribution of trees, branching out when rising to/reaching the ceiling. Whether indoors or outdoors, there are no flat surfaces or straight lines.. instead, the structural and ornamental shapes resemble those of plants, animals, minerals or planetary systems. Stair cases look like giant snail shells, while local flowers and native wildlife are part of the decorations and detail. Light is captured and reflected through a double roof, and streams through numerous large windows, recreating the effect of sunlight pouring through the branches of a forrest. Amidst the bronze ivy leaves you find sculpted bumble bees, earthworms, lady bugs and lizards. A little opening in the door allows a lizard to see the inside of the church. How can one not adore a building which gives such consideration to a small creature! The construction started in 1893, and it is still work in progress. The building of the Glory façade only just began, and the tallest towers (which will almost double the church's height) are yet to be added. The estimated completion date is 2026. Capsule pieces: Sky blue linen shirt (here available online) with off-white pants. 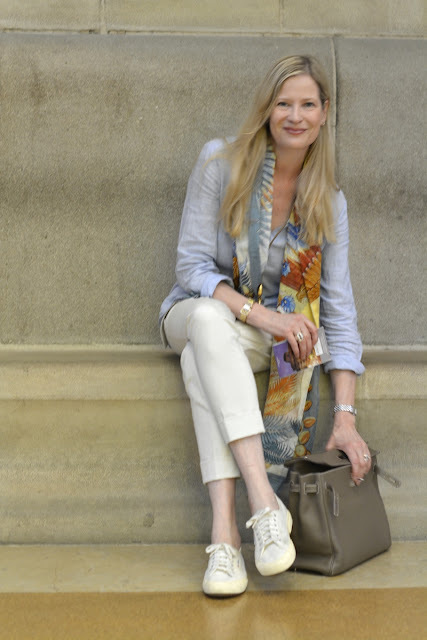 Accessories: Hermès 'Mytiques Phoenix' cotton Pareo, Karla bracelet in caramel and Kelly 35 in etoupe. Pendant necklace in or (back in stock soon). 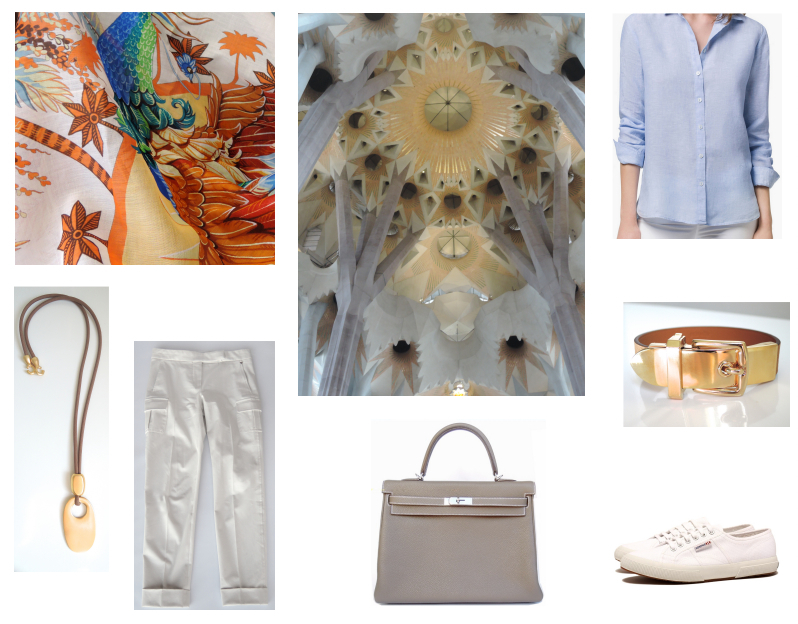 Part IV of the Barcelona travelogue (final part) to come soon. Kind of sort of figured out this fantastic architectural specimen would garner a post of its' own! I love the little lizzie peeking inside...all of God's creatures deserving of a peek! So, cool are your pictures of the progress side by side! Such progress has been made in really a short amount of time given the task at hand. Speaking of cool, you are the epitome of cool, darling friend, as you have changed very little in your comparison pics! Now that's pretty cool! Excited to see what you have in store for us next! As always, thank you for taking us along! In looking back at these pictures, the transformation since 2009 is truly astounding! All sorts of images are playing in my head as I scroll thru. While I know a little about this man and his architecture, I am itching to know more! Thank you! Now you, beautiful one, also grow more beautiful with added years,too! Your smile tells it all! Gorgeous! 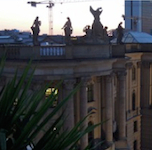 The architecture is fascinating and your ensembles are so chic! Thanks so much, happy you enjoyed the post! I was so hoping that it would be the Sagrada Familia. How could it not be? It has to be considered one of the greatest and most fanciful and totally emotional pieces of art ever put on this earth. How could one not have a gut wrenching, physical and emotional response when entering this masterpiece? There are simply no words for its magnificence and its reverence for the natural world. Every detail is astounding, and as great as the tree support columns are, as well as the light and the color and the sculpture, it's the little lizard that got to me - that lowly little lizard with his very own portal to all that magnificence and holiness. You did a fabulous job capturing its joy and unique beauty for all of us, and I well remember your post back in 2009. Yes, great progress and changes have been made, but you have remained as you were six years ago, perhaps even better. Thanks for this great gift of the Sagrada Familia. I think Gaudi would appreciate it, too. I read that he was so immersed in his work there and so emotionally involved with his labor of love that he actually slept in the church in a small bed in the corner of the construction site. He would not leave it even for a night. Jerrine and MT, a perfect one,two punch! MT and her outstanding photo skills and detailed descriptions coupled with Jerrine's elegant embellishments make for a perfect box set suitable for sale on Amazon! I know I would buy it! Awwww, Trudye, I am touched, and of course, I'd be happy to be combined with MT in an Amazon boxed set. The first set will go to you . . . gratis, of course. Jerrine, I will be happy to do the "press tour" for the project. MT, this is one your most breathtaking posts! You've captured this wonderfully spiritual cathedral in all of it's glory. Your attentive eye caught the whimsical little details (the 'lil lizard!) that could easily be overlooked admist the grandeur. ....and I love the details of your equally lovely look! BTW, what is your secret anti-aging potion?! thanks, haverford. After all, a girl can't have too much good press! 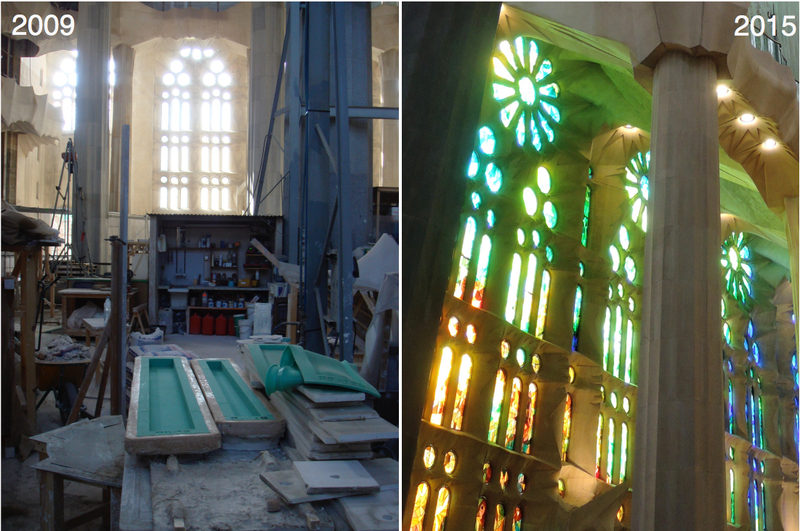 Fabulous pictures showing the progress of the new chaptel into the cathedral . Aww, too kind of you, chère Monica! Hope you are having a wonderful time in Barcelona right now! 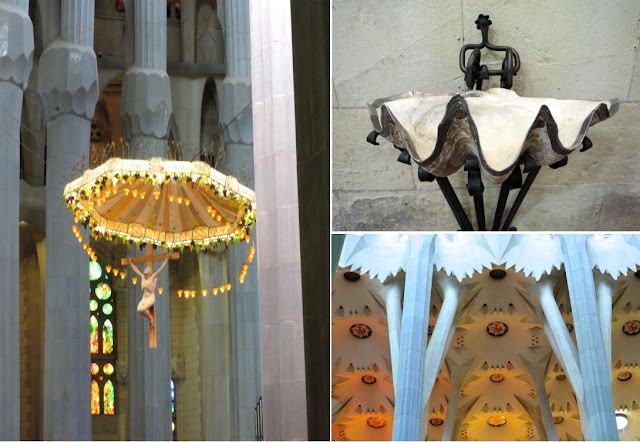 Your description of the Sagrada Familia is fabulous and you really captured its beauty and magnificence! I believe that the efect ot the light inside of the basilica is magical and quite unique. Par contre toi tu n'as pas changée en 6 ans tu est toujours aussi fabuleuse Bravo!!!!!!!!! Looking forward to the next part! And thanks, Jerrine, for your background information! Wonderful travel adventure I have been going on with you around Barcelona, as it has been such a long time since I was there myself and has been so wonderful to see the progress of the Magical SF, simple love your birthday gift bracelet also may I ask how do you find it on the wrist does it have weight similar to the Kelly dog? Stunning! Thank you for sharing all your wonderful photos and narrative - I just have to visit one day. Looking forward to the final part. Happy you enjoyed the post, thank you. Hope you can visit one day soon! This post completely captivated me. I had no idea such a structure existed on this earth. Jerrine described the effect so eloquently, and the little lizard with its own view of heavenly delights seems to have touched us all. Thank you so much, dear MaiTai, for sharing this wonder with us. 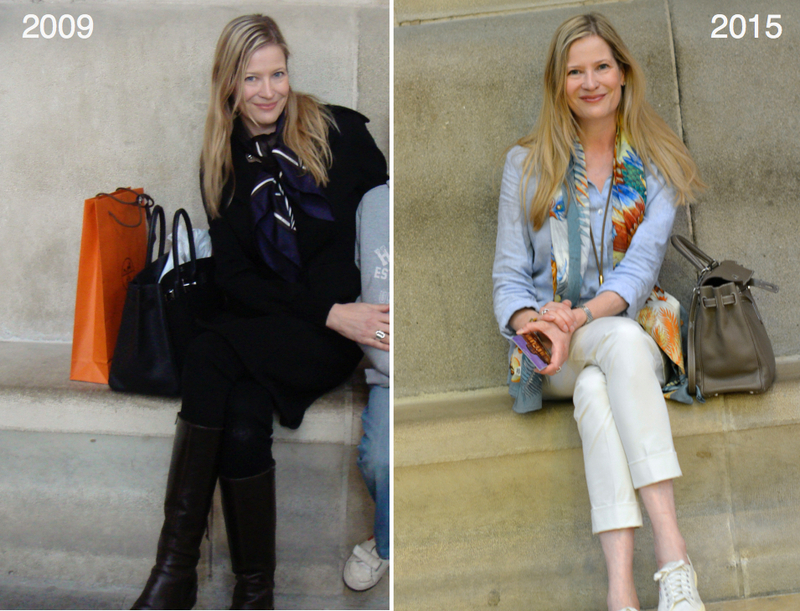 I especially enjoyed seeing the progress from 2009 to 2015. You look, if anything, younger and fresher today than you did then! Fifi, you are most kind. You get one of Trudye's boxed sets, too! Awww, thanks, Jerrine! My provincial eyes have been opened since discovering this blog. And now Barcelona is added to my wish list. How delightful it would be to travel the world! Fifi, I would happily be your travel mate. Maybe we could talk Trudye and MT into coming along, too. Wouldn't we have a ball? The noise from all the chattering would be deafening! PS - When you're in the South of France this coming winter, you really should consider a little side jaunt to Barcelona. It's really not that far, and when you're on the highways in the southwestern part of Provence, you actually see signs for Barcelona. I was quite shocked the first time I saw them. I was sure I was going to end up in the wrong country. Sounds like a plan Jerrine! What merry mischief we would make! Counting my frequent flyer miles as we speak! Count me in, dearest friends!!! Merry mischief indeed!! Fifi, couldn't agree more with you on Jerrine's writing... hers is the finest, wittiest and most elegant I know! These images are so gorgeous…now I have another bucket list vacation! You look so chic and perfectly dressed for the sites!! Happy travels!! Thank you! Hope you'll be visiting Barcelona one day soon! Did I see a new member in your family? Welcome Ms Kelly Etoupe! 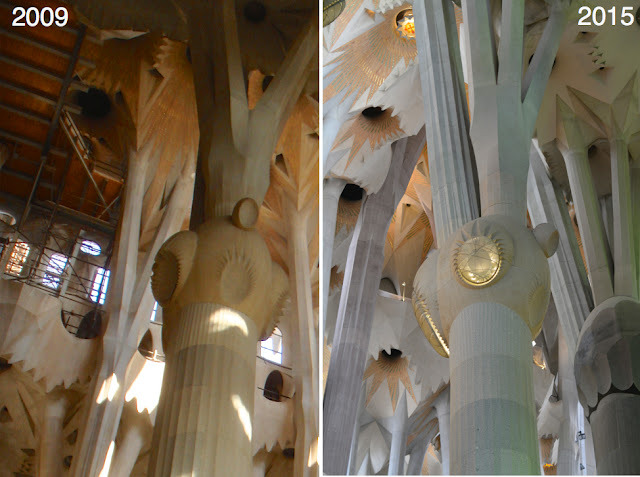 By the way I really enjoyed the visit, I love la Sagrada Familia (Ladies I'm not only focussed on H bags!) and I'm jealous because you look younger every year! It is now official. It is possible to look spiffy wearing sneakers while sight-seeing in a city. This shouldn't thrill me so much, but it does. All of your other posts that I have seen of you in NYC and Paris show you wearing proper shoes. Like Roger V. Which I don't find comfortable. But now I will wear my sneakers without fear of being a fuddy-duddy. I absolutely love wearing sneakers! Your comment made me realize that sneakers have been under-represented in my posts :-) Canvas versions are always chic, and so easy to take care off. Happy walking! He was with us!! It's very rare that the Easter holidays coincide with my birthday, but this year they did! Such a moving post, with the glorious and the touching side by side. My mother fell in love with Sagrada Familia when she saw it in the 1950s, even though she did not live long enough to see the incomparable interior. I was blown away by its grace and grandeur when I saw it for the first time two years ago. There's something thrilling about the idea that these beauties will keep on unfolding till at least 2026. For a structure that calls to mind sunlit groves and expanding galaxies, this stately pace is exactly right. Your post captures so many beauties, including the shimmer of time. Superbly done! What a gifted photographer you are, to capture the exquisite details as well as the majesty of the Sagrada Familia! I'm loving this travel post and can't wait for the third installment. Thanks so much, dearest Annie! Photography has become more and more a passion, so glad you liked the pics. I did not have the chance to visit the Sagrada Familia (I went around only last year), so I really love your pictures, it show really the beauty of Gaudi's genius! Thank you! Merci, ESP! Very much hope you'll have the chance to visit next time! What beautiful photos you took, as always - thank you for sharing! Barcelona's a lovely place to celebrate a birthday; my husband and I celebrated dual birthdays there in 2005. 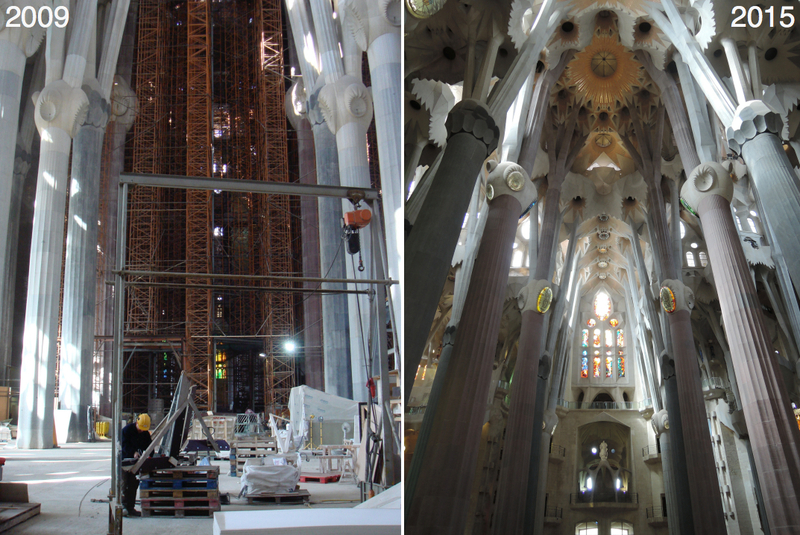 It's wonderful to see the progress on la Sagrada Familia since then - thanks especially for doing the comparison shots to show the differences! So very happy to know the post brought back memories of your special stay, dear Kristen! In 2005 the church must have looked so different yet again... Hope we'll all spend another birthday or two in Barcelona!